Dementia is the symptom and Alzheimer’s is the cause of the symptom. In other words, an individual can have dementia without it being Alzheimer’s disease, such as the dementia resulting from a head injury, Parkinson’s, a stroke or vascular dementia, frontotemporal dementia or Lewy body disease. Some types of dementia may be reversible, but the majority, such as Alzheimer’s, are degenerative and will exacerbate over time. How is Alzheimer’s disease identified? Currently, only an autopsy can definitively confirm the presence of Alzheimer’s disease. However, medical professionals can accurately diagnose Alzheimer’s disease about 90% of the time through assessing psychological and behavioral symptoms, a physical exam, blood tests, urinalysis and neuropsychological tests. There is currently no cure for Alzheimer’s disease, but there are drugs that can help to regulate some symptoms, such as depression, aggression or hallucinations. Some drugs, however, may possibly react negatively with other Alzheimer’s medications as well as worsen other symptoms of the disease. It is crucial to talk through the best medications and plan of care with your loved one’s doctor. Additionally, numerous Alzheimer’s symptoms are caused by non-medical reasons which can often be managed without the use of medications. If the trigger can be pinpointed, the person’s environment can be altered to change the behavior. 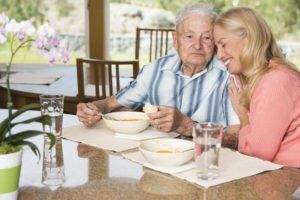 Taking care of your senior loved one with Alzheimer’s can be overwhelming. Hired Hands Homecare’s Santa Rosa, CA in-home care team is specially trained in a wide range of solutions to help Alzheimer’s patients as well as their caregivers. We can help with much needed respite care to allow you time to yourself and to focus on spending quality time with your loved one, leaving the more repetitive tasks to us. We’re helping a number of families navigate the path of Alzheimer’s, and would love to help you too. Contact us online or give us a call us at (866) 940-4343for more information.